The year is 29484, on the planet Rubi-Ka. The first human vessel landed on Rubi-Ka on September 03, 28702. 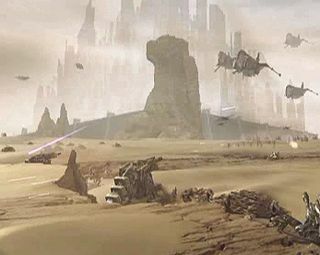 The planet was one large desert, inhospitable and dead, but as it turned out the only known source of notum, a resource that would revolutionize nano-technology. Notum allowed nano-bots to operate outside the human body for long periods of time, making it in great demand across the galaxy, and the hyper-corporation Omni-Tek had exclusive export rights. The planet was leased by the Interstellar Confederation of Corporations (ICC) to Omni-Tek, but mistreatment and poor working conditions in the notum mines eventually led to the Clan. Bending to outside pressure Omni-Tek allowed the clans to operate independently for some time. However, Omni-Tek preferred to have complete control and the planet was put through three civil wars in its history. Not everyone favored a side though and "neutrals" settled in their own areas, including the scientists who created the floating city of Jobe. An unstable peace led to the The Notum Wars, but no one was prepared for the discovery of another dimension that coexisted with Rubi-Ka, the Shadowlands. The Shadowlands and Rubi-Ka were once one planet racked with conflict with those who wanted to use a power called the "Source of Life" to become more powerful, the Unredeemed, and with those who felt its overuse was destroying them, the Redeemed. The Unredeemed won the conflict and the Redeemed fled. 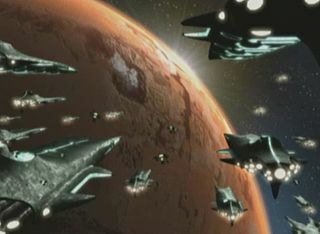 After the Redeemed fled they decided to spread their seeds of mankind around the galaxy in an attempt to regain their losses. At the same time the harvesting of the Source eventually ended up destroying the planet and creating the two worlds. The Unredeemed trapped in this universe tracked down and destroyed the seeds of mankind the Redeemed had placed except for one, those on Earth. In the second-half of the 20th Century the Unredeemed set in motion a series of events that would help them get back to the Source. When the portal to the Shadowlands was open by the scientists in Jobe they found a strange world being torn apart. There were still Unredeemed and Redeemed living there and still in conflict. The Clan leaders decided to ally with the Redeemed while Omni-Tek officials allied with the Unredeemed. Explorers went deeper and deeper into the Shadowlands led by the artificial entity Ergo until they found The Beast. The Beast was killed, after which a robot called Number Nine was discovered sending out a distress call and saying that the Source was no longer protected and that they were coming. The question of who "they" were was answered when the first known alien life outside the Shadowlands surrounded Rubi-Ka and, without any attempt of communication, attacked the planet. The attacks were constant, but not destructive and the conflict between the Clan and Omni-Tek became an afterthought. A turning point on recent Clans and Omni-Tek relations came after an assassination attempt on Omni-Tek's president Philip Ross. Old hatreds surfaced and Omni-Tek began a crackdown to find the people behind the attempt making some fear of yet another conflict. A fear which latter turned out to be completely justified in the minds of many. The assassination attempt on Ross left him in a deep coma, and required Omni-Prime to send a representative to run operations on Rubi-Ka in his place. The successor was Tarkhan Zora, former commander of the Unicorn Company. Zora's mission was to restore Omni rule on Rubi-Ka, and he set about doing so with relish. For more Anarchy Online history see the Timeline of Anarchy Online history. The Clan is represented by the Council of Truth. Omni-Tek holds Omni-Tek.org department meetings. The Neutral Population of Rubi-Ka, on a whole, is not represented by any one. Many private organizations have been started to solve this problem. At one point in time the ICC was said to have been the guardian of the Neutrals. The only true neutral government currently in place is that of the Newland City Council. To find out more about recent storyline events, check the Editor News forum on the official AO website to find the news media. There are also events localized to the Atlantean and Rimor dimensions. Prophet Without Honor, official movie version, Episode 1, Part 1 (of 5) on YouTube. This page was last edited on 7 April 2018, at 17:03.